It's sometimes surprising what people will publish just to milk the hype the maximum. It's even more surprising that it works every single time and there's always someone who will buy the commercial money makers that he or she has absolutely no use for. Virtua Fighter 2 CG Portrait series is one such money maker. One disc for every single character in the game plus one special CD - Golden Dural Disc. To get the last one you had to send a tiny proof of purchase which you could find on the spine cards of all the discs in the series. Buy them all, collect the spine card coupons, mail them to Sega before 1996.02.29 and wait for your Dural disc. But what are the CG discs exactly? Not much. They contain static CG renders of the game characters in form of a slideshow and an audio track in two versions. There's also a karaoke mode which allows you to sing along during the slideshow. The lyrics are displayed at the bottom of the screen. In japanese of course. A thing worth mentioning are the lyrics to the songs. Some of them contain some english words or sentences mixed in with the japanese lyrics. This is never a good idea when it comes to japanese songs and it's just painful and funny at the same time to listen to the CG portrait songs. The best example on how crazy it can get is Lion's CG Portrait theme. You can listen to it by clicking on the play button below. Don't forget to follow the lyrics. 2007.04.13 Fri Dreamcast ☆ Saturn Comment Tweet This! On monday I got my hands on two "new" titles. Wachenröder and Last Bronx. I will try to post some more info and pictures as soon as find some spare time. Dear reader: Don't hate me for the constant lack of updates. 2007.04.04 Wed Dreamcast ☆ Saturn Comment Tweet This! 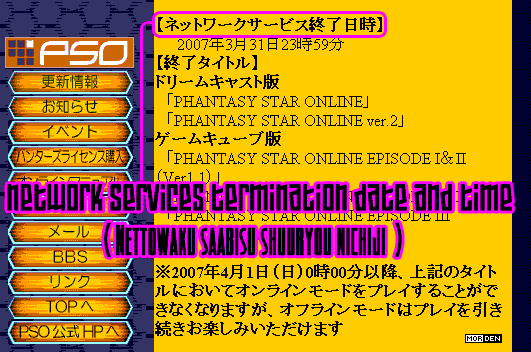 It's a miracle that PSO stayed up online for as long as it did. And I mean the DreamCast version, of course. Well, Sonic Team have finally decided it's time to put the old beast to sleep and released a news bit on the official site stating, that both Japanese and European servers will permanently go offline on March 31st 2007. This is a huge blow for the PSO community as they will be forced to either switch to another platform or connect to homebrew servers. For DreamCast PSO players it will probably be the latter. Check out the image below if you want to take a look at the official info. Just click on the image if you wish to enlarge it. 2007.02.18 Sun Dreamcast ☆ Saturn Comment Tweet This!